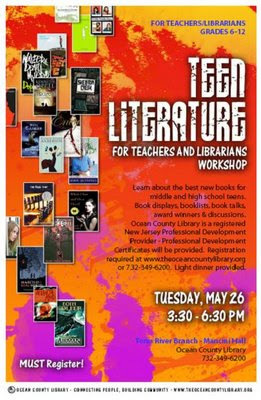 On May 26th, I'll be speaking at the Teen Literature for Teachers and Librarians Workshop, Ocean County Library, Toms River, NJ. The workshop is from 3:30 to 6:30. You need to register. Want to know what is really exciting? Marc Aronson is the keynote speaker! I KNOW.